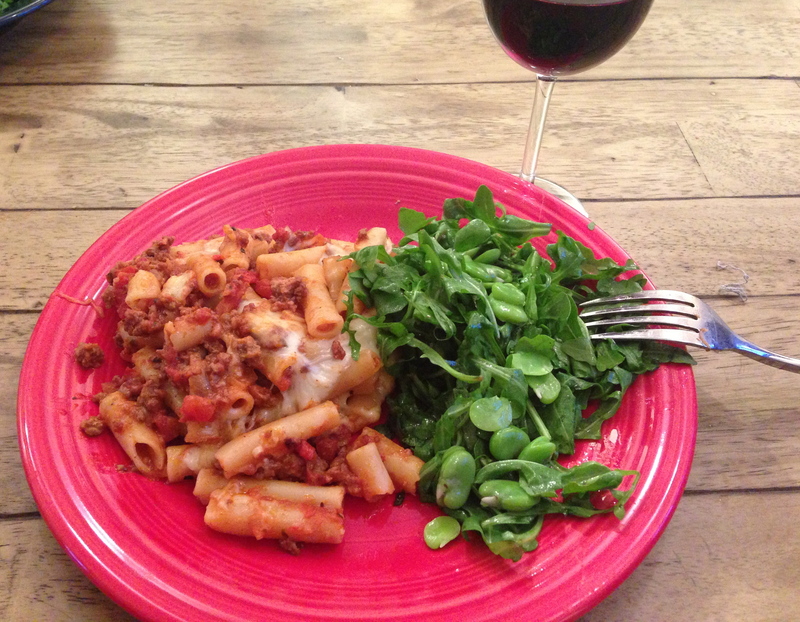 I’m so thrilled to bring you not one, but two super budget-friendly meals this week! 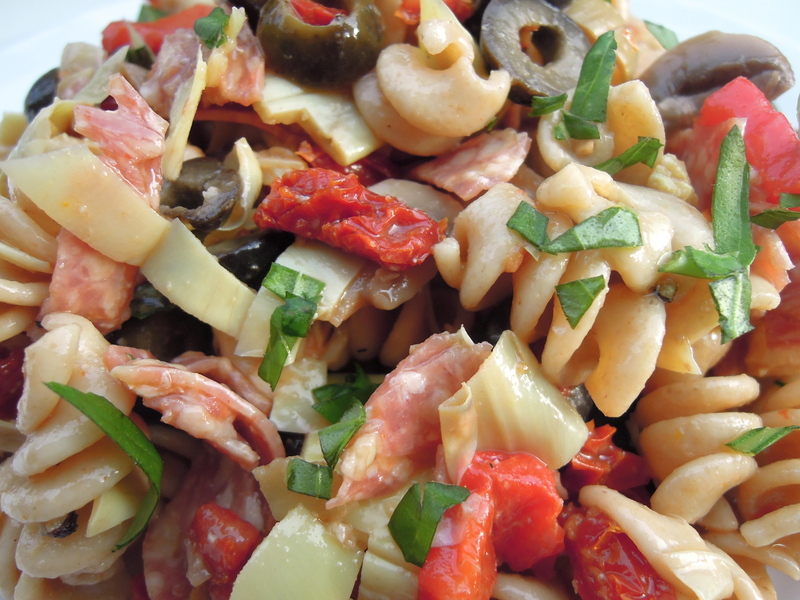 Starting with this gem: Antipasti pasta salad. It’s just in time for those Labor Day Weekend barbecues you’ve got lined up, too. This also happens to be an almost no-cook meal. Besides boiling water for the pasta all you have to do is open some jars/cans and get chopping, which is perfect since it’s about 300 degrees here in Chicago with 110% humidity. Clockwise from left: Julienne cut sun dried tomatoes, balsamic vinegar, extra virgin olive oil, marinated mushrooms with garlic, artichoke hearts, fire roasted red peppers, and sliced black olives. Not pictured: whole wheat fusilli, ciliegine mozzarella, and salami. 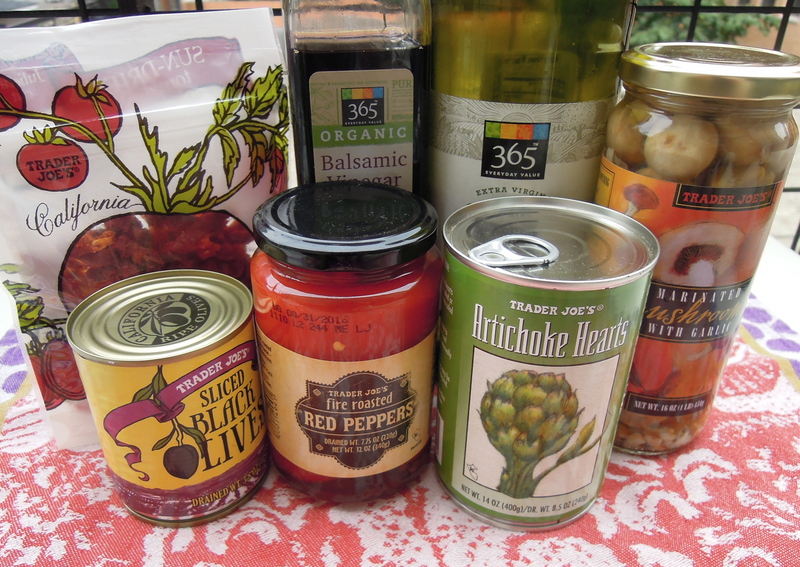 The final tally, counting everything above including the not-pictured ingredients (but not the olive oil & vinegar since you likely already have those) comes to just $15.33. As a side in a BBQ spread you could easily feed 8-10 people. Since this was dinner for me (and lunches for the next few days) I’d say you could serve it as din to about four adults. Not bad, not bad at all. Oh and did I mention how delicious it is? Just look at those bites of Mediterranean goodness…delicious is pretty much the only direction this situation could go. Cook pasta according to package directions. Drain, set aside and let cool. 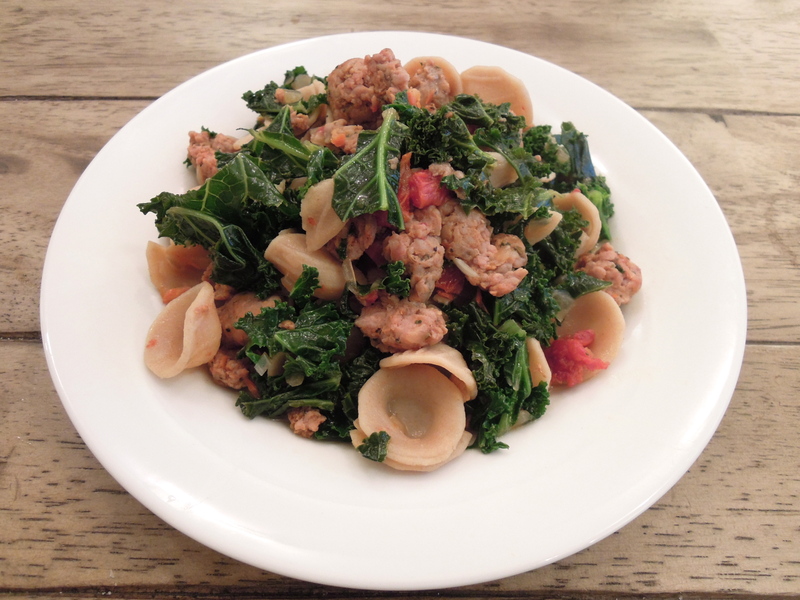 Once pasta has cooled, add to a bowl along with rest of pasta salad ingredients. Combine vinaigrette ingredients in a bowl and whisk until thoroughly combined. Pour onto pasta ingredients. 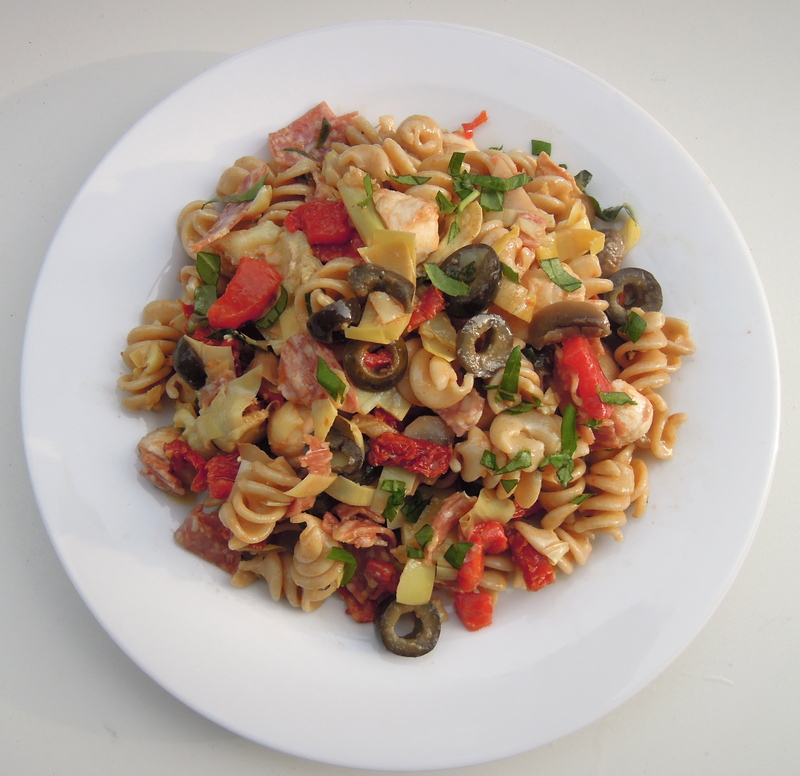 Mix until pasta salad is coated in vinaigrette. Add basil and mix to distribute throughout salad. Serve chilled or room temperature. 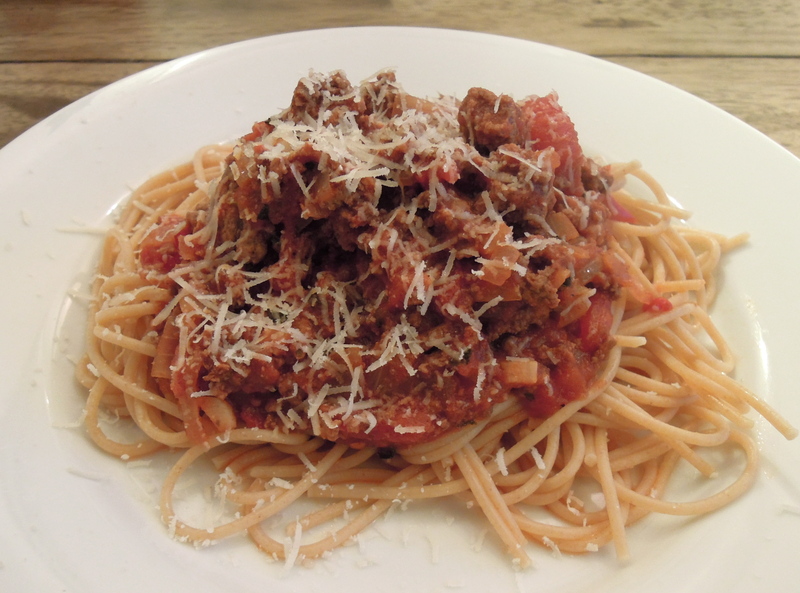 This entry was posted in Pasta on August 27, 2013 by Paige Greenfield. Oh how I desperately wish I had better photography skills….and more sunlight in our apartment…and the ability to cook in the middle of the day so I could take photos in the daylight so you could more accurately see just how insanely delicious this meal was. Heck, I wish you could come over for dinner and have a bite. We still have leftovers! 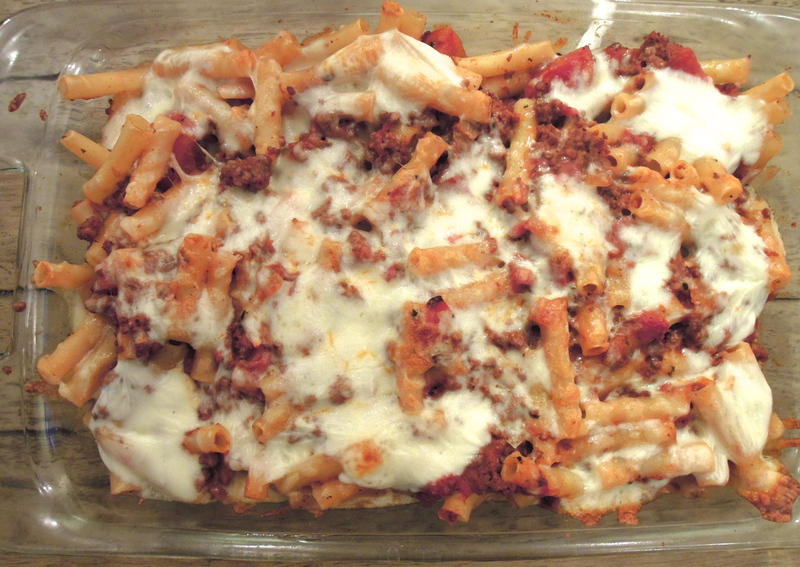 If the photo doesn’t do the meal justice (it doesn’t) I’m sure the recipe will: My favorite meat sauce recipe, plus almost fully cooked ziti, plus freshly shredded, soon to be gooey mozzarella cheese. Pour it into a casserole dish and cook at 400 degrees for 20 minutes. Boom. True story: I cooked with cheese. I ate cheese. I liked cheese. Please don’t go spreading this around, it’ll tarnish my cheese-hating reputation. I was so proud of my accomplishment that, upon tasting it, I declared to Robert he should make me his wife. Good thing I happen to have a few other attributes going for me besides the occasional culinary success. Sometimes humility isn’t one of them. Heat oil in a pan over medium-high heat. Add ground beef and cook until brown. Tansfer beef to plate. Add onion and garlic to skillet and sauté until onion is tender, about 5 minutes. Stir in basil, oregano, paprika, and red chili peppers and continue cooking 1 minute. Return beef to skillet; add tomatoes, tomato sauce ,and wine. Simmer on low heat for about 20 minutes. While sauce cooks, cook the pasta just shy of the recommended cooking time (about 7 minutes if the box says 9 minutes.) Drain and rinse with cold water to stop the cooking. 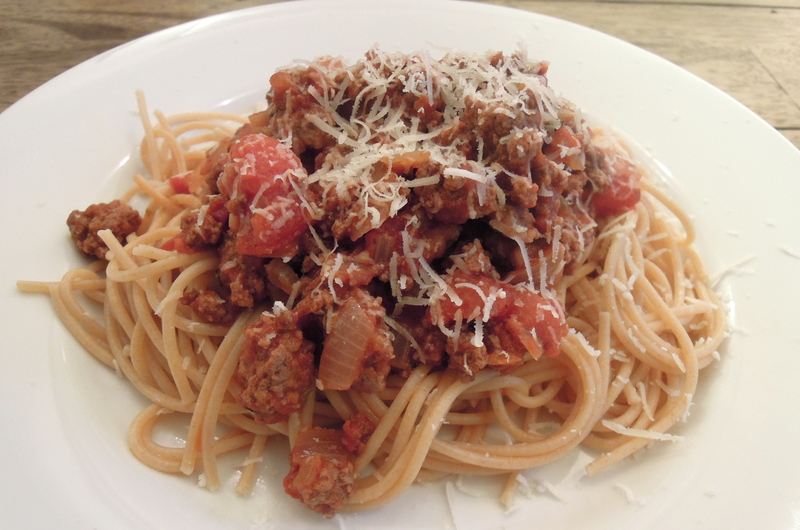 Return pasta to pot, add meat sauce, and toss to coat evenly. 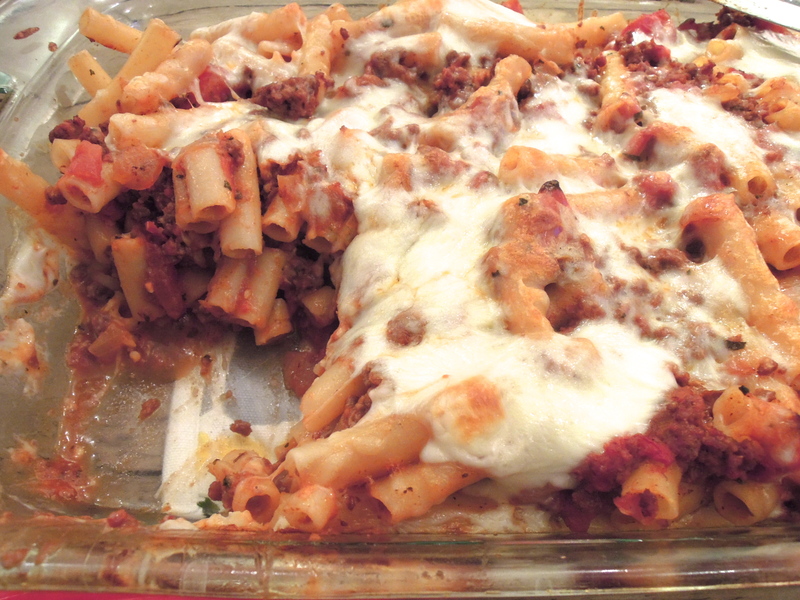 Pour half the pasta and sauce mixture into a 9 x 13 casserole dish. Top with half the cheese. Add the rest of the pasta and sauce and top with the remaining sauce. Cook about 20-25 minutes until sauce is bubbly. This entry was posted in Pasta on April 22, 2013 by Paige Greenfield. Oh my. I’ve certainly come a long way. Remember how back in January I mentioned I hardly ever cook pasta and posted my first pasta recipe on the blog? Since then pasta of all kinds seems to have become a staple around here and is on the menu about every week or two. Well, now I’ve got another keeper. I’m not sure what changed exactly. Maybe it’s the fact that I’ve found I can eat just enough without stuffing myself? Or maybe it’s because pasta recipes tend to come together quite quickly, which is always perfect on a weeknight. Whatever the reason, there are two very happy eaters in this household. I’m especially excited to share this recipe. Orecchiette may be my favorite pasta shape–it captures just the right amount of sauce and other components so perfectly in every bite. I was thrilled when I found whole wheat orecchiette at Whole Foods (!!!) Of course you already know my love for kale knows no bounds and any time you add sun-dried tomatoes to something you know it’s going to be good. The only ingredients you need! After a bit of research, I combined a few different recipes to get this outcome. One of the things that really made a difference was a tip I gathered from this recipe, where you drain the sun-dried tomatoes in a sieve over a bowl and use some of the remaining oil when cooking. Unless you cooked the meal you may not know it’s there, but the oil imparts a certain kick that you could only get from oil that’s been hanging out with sun-dried tomatoes for who knows how long. I used spicy Italian turkey sausage, but you can use absolutely any kind you like or sub it out and add some beans instead. Serve with a nice glass of red wine, some freshly shaved parm and you’ve got yourself a swoon-worthy dinner. Enjoy! Cook pasta according to package directions. Drain and reserve 1 cup cooking liquid. Drain sun-dried tomatoes in a sieve over a bowl. Roughly chop sun-dried tomatoes. Heat olive oil in a pan over medium-high heat. Add sausage to pan and cook until sausage is browned, about 10 minutes, using a spoon to crumble. Transfer sausage to a bowl. Add onion, garlic, sun-dried tomatoes, and 2 tsp of oil from sun-dried tomatoes to the pan. Sautee about 5 minutes until onion softens. Add kale and chicken broth. Cover and simmer until kale is tender, about 5 minutes. Stir in pasta, sausage, and reserved pasta water. Season with salt and pepper to taste, sprinkle with crushed red chili pepper. This entry was posted in Pasta on March 7, 2013 by Paige Greenfield. Saturday morning I flipped through cookbooks, food magazines, and Pinterest for inspiration and put together a list of dinners to make this week. This is actually one of my favorite weekend activities (nerd alert!) and someday I’d love to write a post about how exactly I do this. I then put my grocery shopping list together and headed off to take a yoga class. 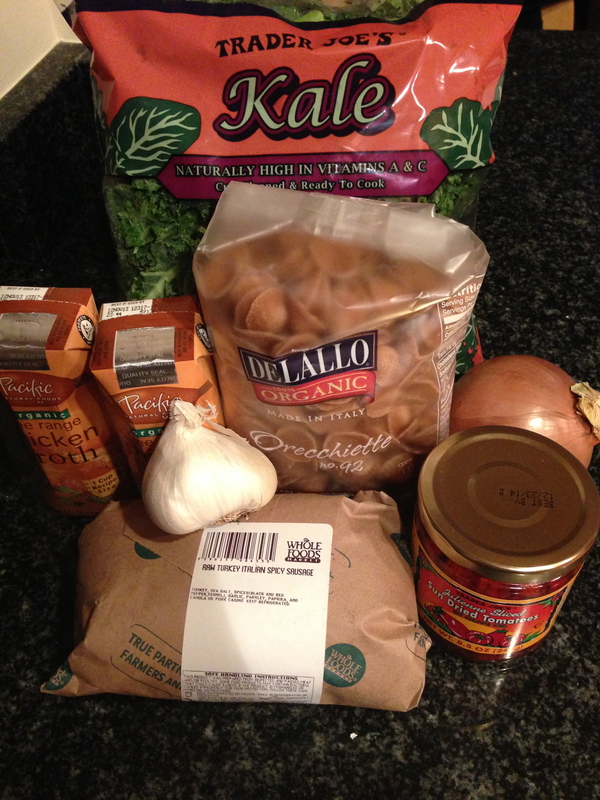 Later that afternoon I hit up Trader Joe’s and Whole Foods to pick up ingredients for the week. Still, I summoned enough energy to put together this dinner. Oh my goodness was it good! I’ve been on a pasta kick ever since I made penne with shrimp and sun dried tomatoes a few weeks ago. I love making pasta dinners on weekends because it feels substantial enough–maybe even a little indulgent like you’d get at a restaurant–but I can still up the health factor by choosing good quality ingredients. Plus, keeping with our eco friendly and budget conscious goals it’s more affordable than dining out of course. I also love how this meal was vegetarian, yet the mushrooms and beans lend almost a meaty texture to make it completely satisfying. Ever since my creamy sauce snafu a few weeks ago I’ve been determined to give it another shot and this was a perfect opportunity to do just that. I’m happy to say it went off without a hitch! Miraculously, around 9:30pm, I felt a wave of energy wash over me and I told Robert I was ready to go to the concert. I traded my yoga pants and sweatshirt for corduroys and a sweater and we walked the few chilly blocks to the venue in time to see a few songs by one of our favorite bands (Freelance Whales). I’m so happy I rallied! Sunday morning I prepped a slow cooker chicken stew recipe (coming this week!) and taught a level 2 yoga class. These classes are a more advanced and intricate format than the level 1/intro classes I’ve been teaching since October. It was only the third level 2 class I’ve taught so far (I passed my audition last week! ), but each time I feel more comfortable and calm. It’s just so much fun! Teaching level 2 classes has been my goal all along and I’m happy to say it’s just as fulfilling as I imagined it would be. The rest of the day consisted of some work, a phone conversation with a potential Reverend for our wedding (very promising! ), and a relaxing evening on the couch preparing for another busy week. I hope you all have a wonderful day! If you have any question marks when it comes to dinners this week I hope you’ll consider this quick and delicious meal. Enjoy! Heat oil in large skillet over medium-high heat. Once hot, add onion, shallot, garlic, and mushrooms. Season with salt and pepper. Saute until mushrooms release liquid and become tender, about 15 minutes. Add wine, beans, and spinach. Cook about 10 more minutes. Remove pan from heat and stir in cream. Garnish with fresh parsley and serve. 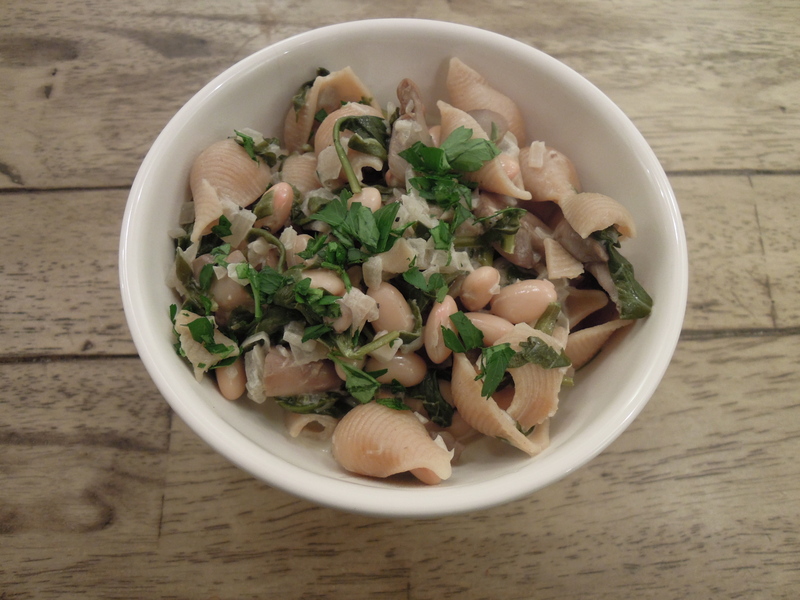 This entry was posted in Pasta on January 21, 2013 by Paige Greenfield. You may have noticed that pasta recipes don’t show up around here very often. There are two reasons for that. 1. I don’t have a drop of Italian in my DNA, which means I didn’t grow up eating lots of pasta and it’s not something I have tons of experience with. 2. Truth be told, I’m a bottomless pit for pasta (and pizza, by the way). So, much to my pasta-loving fiance’s chagrin, I don’t cook it that often. Fortunately, I exhibited just enough restraint this Sunday to pull off this recipe without nursing a bellyache afterward. And you know what? It may be one of the best things I’ve ever made. Like, ever ever. For the first time in my life the words, “this tastes like it’s from a restaurant!” spilled out of my mouth regarding something I made. It was the first time I ever tried to pull off a white wine garlic sauce, which is one of my most favorite things ever. And it’s so easy! Any time I’m in a restaurant and I see the words “white wine garlic sauce” you can almost always bet that’s what I’m getting. If I’m keeping it real around here I have to admit this meal almost didn’t happen. It was on the verge of being a complete fail. You see, I had the bright idea to add just a little bit of cream to the sauce. But, trying to make it a little healthier, I picked up half-and-half at the store instead of cream. When I added the half-and-half to the sauce when it was done…it curdled! (A quick Google search has me thinking it’s either due to the lower fat content of half-and-half vs. cream or it’s because the liquid was cold when I added it to the hot sauce.) I won’t go into detail about how gross curdling is because I want you to think positively about this sauce and love it as much as I do. I had a solid three minute freak out until I realized I had just enough ingredients left to give it another go. So I tossed out the first batch of sauce (luckily, I hadn’t added the shrimp, greens, or penne yet) and started from scratch–omitting the half-and-half this time, which was definitely the way to go all along. This meal hit all of the right notes for this time of year. 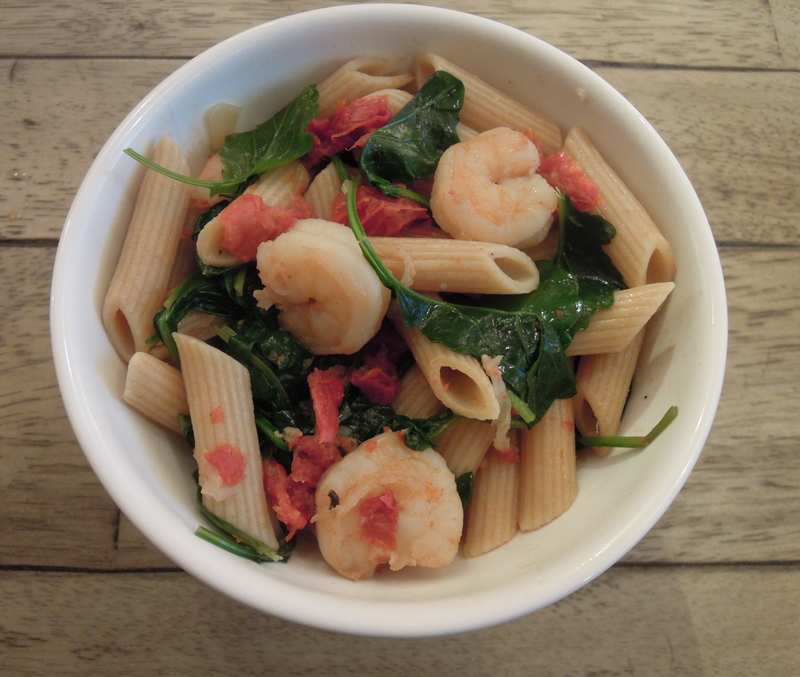 It’s light and healthy, featuring whole wheat fiber-rich penne, protein-packed shrimp, and nutrient-rich greens. At the same time, it’s warm and comforting–just what the doctor ordered in early January. Cook penne according to package directions. Drain and set aside. Heat olive oil in a large pan over medium heat. Add shallot and garlic. Saute until fragrant – about 1 minute. Add shrimp and saute until cooked through. Remove shrimp to a plate. Add sundried tomatoes to the pan. Saute for about a minute or two. Add the wine and broth and bring to a simmer. Continue simmering liquid for about 12-15 minutes. (If you like, cut tails off of shrimp while you wait for the liquid to simmer – though it’s not necessary.) Add the greens and red pepper flakes and cook until greens are wilted. 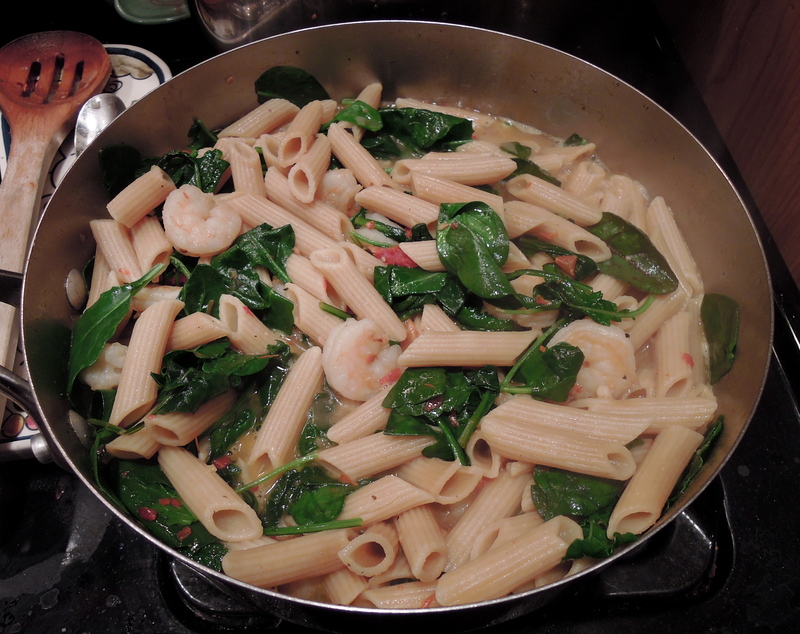 Add shrimp and penne to the pan. Season with salt and pepper to taste. Cook until shrimp are heated through. 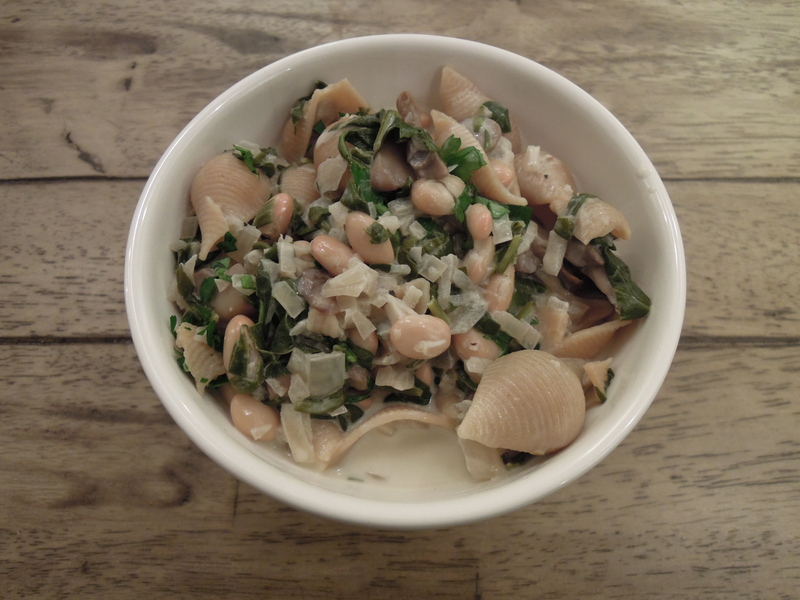 This entry was posted in Fish, Pasta on January 9, 2013 by Paige Greenfield.